Spray 12-inch nonstick skillet with nonstick cooking spray. Heat over medium-high heat until hot. Add bell pepper and onion; cook and stir 2 to 3 minutes or until crisp-tender. Add gravy, broth, water, chili sauce and meatballs; mix well. Bring to a boil, stirring occasionally. Reduce heat to medium. Cover; cook 5 minutes or until meatballs are thawed. Add uncooked noodles; mix well. Cover; cook about 10 minutes or until noodles are tender and meatballs are thoroughly heated, stirring occasionally. Remove from heat. Stir in sour cream until well blended. Sprinkle with parsley. Goulash is a traditional Hungarian recipe of paprika-seasoned beef stew served over buttered noodles and garnished with sour cream. 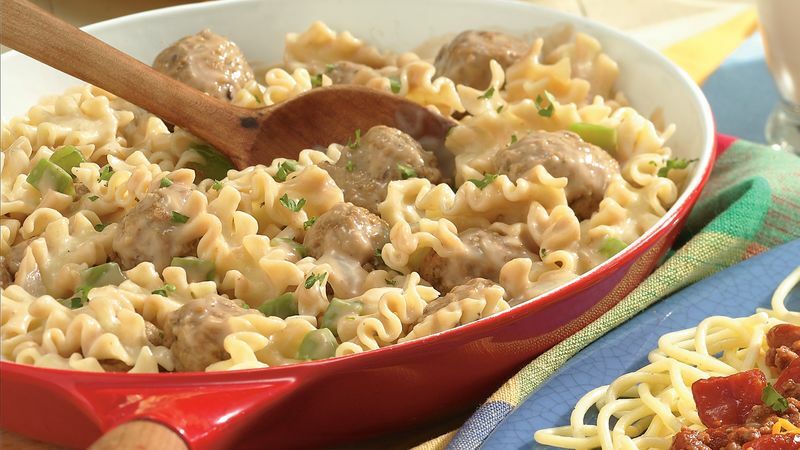 This fast skillet version calls for meatballs and mini lasagna noodles. To save time, use frozen chopped onion and bell pepper. For authentic Hungarian flavor, add 1 to 2 teaspoons of paprika to the skillet along with the chili sauce. Garnish each serving with a sprinkling of poppy seed. Hearty rye bread and deli cabbage salad go well with this Eastern-European-style skillet meal.